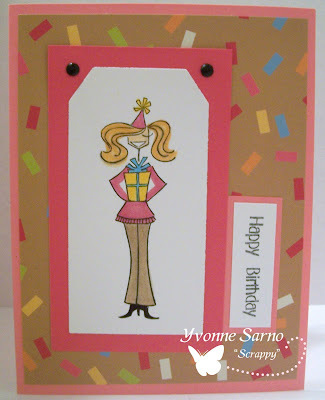 I've been busily making a whole lot of cards for swaps as well as several for friends and family lately. It's been something of a challenge as we are preparing to move yet again! Luckily the packing is going well, but I'm starting to feel the crunch of time. Today I had to begin the process of packing up some of my stamping area. I was feeling some serious panic as I sealed the box containing almost all of my cardstock! So in order to avoid a full on meltdown, I've packed up a few 'kits' worth of stuff so I can stamp, and create during any breaks I might find while in the process of moving! I will be very unlikely to have any 'spare time', but as those of you who know me have witnessed, I will find tiny snippets of time wherever, however and whenever possible! Anywho, I made this card for Jackies 'Use your images swap' on Splitcoaststampers. As a diehard image HOarder, I had several reams of images from which to choose from. However, these cutesy lil' Changito's were calling my name! I used a DCWV cs base & layered on SU Close to Cocoa cs. I used some yummy May Arts ribbon and cuttlebugged the swirls onto a scrap of SU Real Red cs. I added the sentiment (Studio G) on another mounted scrap of cs. Finally, I added the image on GP 110 White cs which I colored with my Copics. These cute lil' monkeys remind me of how some of my friends help me keep things in perspective, and keep me laughing through some of the most stressful things! 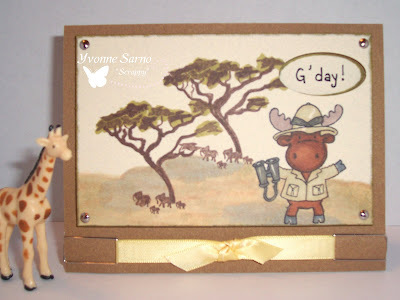 Thank goodness Stampendous created them, and that my good friends Sandye and Tammy carried a bunch of them to this years HPC so I could nab me some immies! Check out the following links for to join in on the fun in Jackies Swap thread, and to get some of the May Arts Ribbon pictured above! My good friend, Mandabella opened up a Bella swap - featuring ONLY Bellas! I finished one card spot so far and will add the others to this post as I get them done. In the meantime, what do you think of this one? 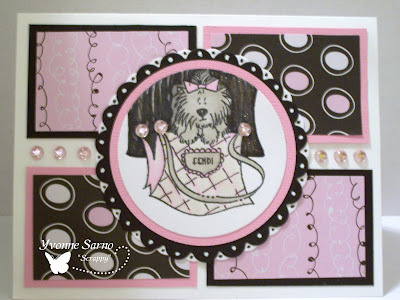 I used Stampingbella's Gifttabella w/hat stamp, Copics and some of Gina K's wonderful Pure Luxury CS to get creative! I matched up my colors to this pretty confetti print DP that I found in my *miniscule* DP collection - including the SU Base and pink mounting colors. 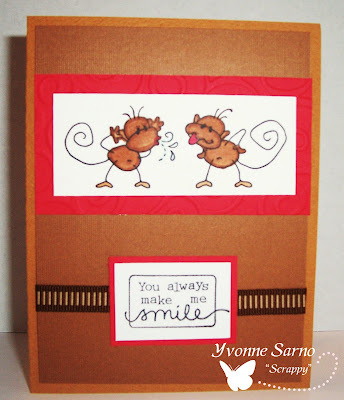 The sentiment is by MFT - another of my favorite stamp companies. Tonight with very little time to spare, I decided to attempt one of the Shirleys2girlz challenges! The card came out pretty good IMHO, but the process of getting a picture taken and posted was incredibly difficult! BUT I think it was worth it! What do you think? Take a walk on the WILD SIDE....! It's been a long, busy, and exciting day! We were told that our house offer has been approved, so we are soon to be First-Time-Home Owners! WOOHOO! Lookie Lookie! Bloggy ... uh.. cookies?